If you have ever used the Minecraft Forge mod, VeinMiner, this plugin aims to recreate exactly that in an efficient, flexible and feature-filled way. Anything you've ever seen from the VeinMiner mod should be in the VeinMiner plugin, of course with a few minor feature changes due to the limitations of server modifications. If you have not yet used the VeinMiner mod... play more mod packs. VeinMiner allows players to mine an entire vein of ores whilst sneaking and breaking an ore. It will break the entire vein when only needing to break one ore. Much like the original mod, there is an extremely powerful block list which can be modified in-game, as well as in the configuration file, to determine which blocks (and which data values) are capable of being vein mined. The lists are separated by tools and can be grouped by aliases to allow for a more flexible and simplistic mining experience. This is a fantastic perk for Prison, Factions and Semi-Vanilla servers that isn't overpowered, but still gives players a rewarding benefit for donating to your server. DISCLAIMER: I am in no way related to or in collaboration with the Minecraft Forge VeinMiner project, or the creator portablejim. This is simply a recreation of a popular mod to be enjoyed on CraftBukkit / Spigot servers. Commands for VeinMiner are lacking in features, but they can be useful for configuring most of the resource without having to open the configuration file, and they accomplish their purpose. Description: Allow access to the "/veinminer blocklist" sub-command, and all of its sub-commands, "add", "remove" and "list"
VeinMiner has been happily open sourced for a long time and is ready to be contributed to! If you are a VeinMiner API user or if you are simply interested in the code that goes behind the inner-workings of this plugin, its source code is available on GitHub for you to browse and hack away at. You can find the source code by going to VeinMiner's public repository. If you are familiar with Git, you are free to clone, fork or make a pull request to VeinMiner. If I approve of any changes you decide to pull request, I may consider merging the changes into the main branch and uploading a version with your code. You will be credited in the very next changelog, as well as a link to your PR. This resource is brought to you free of charge without any obligation to pay anything! I love to provide free resources such that people are enjoying it on their servers. Unfortunately, not everything in life is free and I will eventually need some monetary support of some kind. If you enjoy this project and what it provides to your server, please do consider donating as a little thank you for my hard work. I spent countless hours working on this project and all of it is provided without asking for anything. Donating is not a requirement, and I do not expect anyone to donate. If you so chose to donate out of your own good will, I greatly appreciate the support, and I hope that you enjoy this resource as much as I do developing it! Thank you! 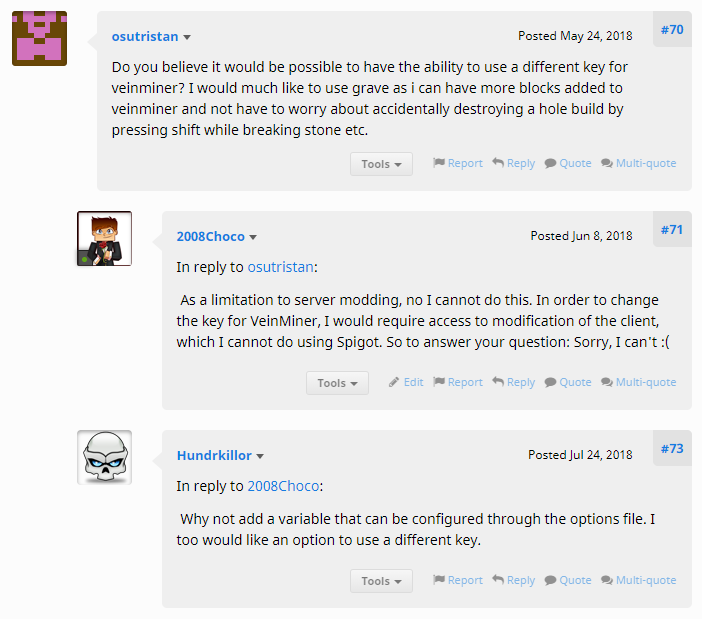 Is it possible to change the key to activate veinminer? See previous comments asking this exact same thing. It's one of my most commonly asked questions. This is great! Is there a block override to this? like on veinminer? I'm not sure what you mean by "block override"
When i use command "/veinminer mode auto"
How would I put the permissions in the permissions.yml? If you mean Bukkit's permissions.yml, I'd advise against that. Bukkit's permission file wasn't designed to be used to grant and revoke permissions. I recommend the use of a proper permissions plugin such as LuckPerms. I can't get it to work at all. My server is running 1.13.1 and none of the versions past 1.12 seem to be working. I've tried adding things to my server permissions file but I'm not sure how that works. The commands show up in game, but none of the veins are being mined when I mine a block with a pick. To use VeinMiner, you're expected to be running the latest version of CraftBukkit or Spigot (using Spigot's BuildTools) and the most recent release for VeinMiner. As for permission nodes, refer to your permission plugin's manual/description on adding/removing permission nodes from groups and players. Having problems loading VeinMiner on my Spigot 1.12.2 server, I believe everything is up to date and I am running Java 8. I get the same error from the most recent version (1.13.2 at this time). Any ideas? Hey, I made a Server for me and my friends with this plugin, at the beginning everything worked, but since i tried to do the permissions of the plugin it doesn't work anymore. I reinstalled it many times, but it still doesn't work. And the commands are functioning and i also checked the config but it was alright. Edit: Ok, I downloaded an older version of the plugin and now it works. I literally have not touched permissions whatsoever since they were added in earlier versions of the plugin so if they're "not working" it's likely because you've not defined them properly. "veinminer.veinmine.axe", "veinminer.veinmine.hoe", "veinminer.veinmine.pickaxe", etc. they're all the same. I've triple checked. How can I use the permission nodes? On my server, only ops are allowed to use it ATM, I would like it to be usable by anyone.